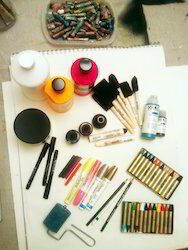 Exporter of a wide range of products which include art material, painting accessories and acrylic palette. We are a well-known manufacturer and exporter of precisely engineered Art Material. Manufactured using premium quality raw materials and advanced technology in compliance with international quality standards, it is highly demanded. Our offered material is highly accredited for features such as brilliant quality, compact design and long life. Moreover, clients can avail the offered range from us at highly affordable prices. 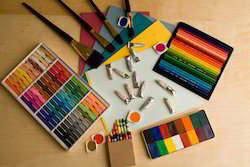 Our valuable clients can avail from us a high quality range of Painting Accessories. These accessories are manufactured using supreme quality raw materials with high precision. The offered range is recognized for its features like dimensional accuracy, precise cutting, user-friendliness, durability and optimum quality. Further, this cutter is used for cutting papers in different sizes. We offer this range in various specifications at the most affordable prices. 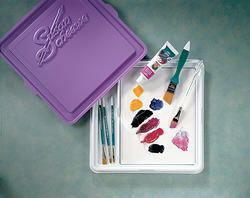 Backed by rich industry experience and knowledge, we are offering our clients Acrylic Palette. This palette is designed to perfection using excellent quality raw materials and latest technology, this product is known for its optimum quality, lightweight, compact design and durability. The offered range is stringently tested by our quality controllers in order to deliver a defect-free range at clients’ end. Clients can avail the offered range from us at market leading prices. Looking for Art Accessories ?